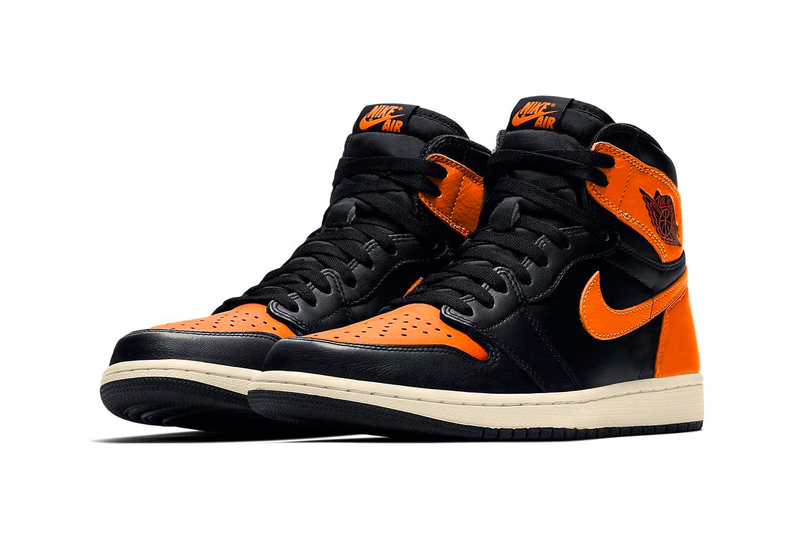 UPDATE (26 March 2019): The Air Jordan 1 High OG “Shattered Backboard 3.0” officially drops on October 26 at select Jordan Brand retailers and nike.com for $160 USD. ORIGINAL STORY (3 March 2019): After delivering two Air Jordan 1 “Shattered Backboard” colorways, Jordan Brand is set to pay homage to one of Michael Jordan‘s most iconic moments once again. The third iteration of the Air Jordan 1 Retro High OG once again references when MJ shattered a backboard while dunking during a Nike exhibition tour back in 1985. This time around, the classic court model features a smooth black leather base accented by orange overlays and perforated toeboxes. Branding on the shoe comes in the form of midfoot Swooshes, Wings motifs at the ankle and “Nike Air” tongue tags. Elevating the upper is a vintage sail midsole paired with a contrasting black rubber outsole. Priced at $160 USD, the Air Jordan 1 Retro High OG “Shattered Backboard 3.0” is set to release at nike.com and select Jordan Brand retailers October 4.